Nate and I are travelers. We seem to spend more weekends away than at home. This slowed down for a short time, but now that Scarlett has gotten a little older, we are back to our old ways. 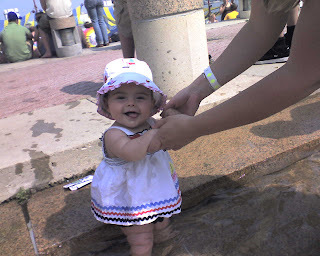 On Saturday, we went to Philadelphia to stay with Nate's Aunt Julie and take Scarlett to her first music festival (our favorite thing to do). I got up at 6 to clean and pack. I have to leave with a clean house. I guess this is so that the robbers will not think less of me, I don't know. Anyway, I can usually do this in 2-3 hours. By noon I was still scrambling and Nate was helping out. Then I was shocked at the HUGE pile of gear we were taking for two nights. But it all seemed essential (and 90% of it was Scarlett's!!) So we get on the road and I am picturing us strolling around downtown Philly when suddenly I remember "the stroller!!" So fifteen minutes later we have the stroller and are leaving town again. Now Scarlett whimpers. This means she has dropped her binky, so I do the usual reach back to re-bink. Only when I grab the bink, I feel something funny. I bring my hand back, and all I can say is CRAPAMUNDO. Earlier we had giggled at her grunting a little bit, but little did we know the floodgates had been opened. We pulled over at the McDonalds to assess the damage. This was poop tsunami-style. Nate just kept asking "What should we do?!?" while I tried to throw diaper wipes at the problem. He was holding her under the armpits while I was decontaminating and trying not to puke. Meanwhile Scarlett has this grin on her face as if she is a little proud of the whole thing. I really feel so bad for the poor McDonald's bathroom cleaner!! Hours later than promised, we did show up in Philadelphia. Scarlett had a fabulous time with her Aunt Julie. The day of music was excellent. Scarlett made friends with another baby there (as well as charmed just about everyone who walked by) and giggled with enthusiasm while dancing and playing in the fountain. 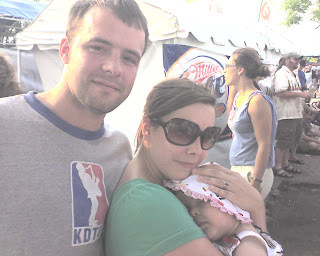 She fell asleep rocking in my arms while we listened to the Wailers sing "Stir It Up." I have realized that the days of picking up last minute to drive all night to some week-long crazy festival may be behind us for now, and it may take several tries to get out of the door, but there are still many more adventures ahead of us. Only now they are even sweeter as we share them with Scarlett. That child is beyond cute. I especially love her tongue hanging out and her outfit - both gifts from an adoring grandma. I'll start saving her auntie Grace's out grown hearing aids when she becomes deaf from the music concerts. This was a hysterical, detailed description of a moment every mother has at least once - and most a lot more often! I loved the way you put things! You made me laugh out loud! i remember when i also realized you just can't pick up and go. one of many new changes that come with the territory of parenthood. that was hysterical!!! we've had quite a few poop explosions to gag on too. Scarlett is cute cute cute! Where is a picture of her in a baby-sized band t-shirt?